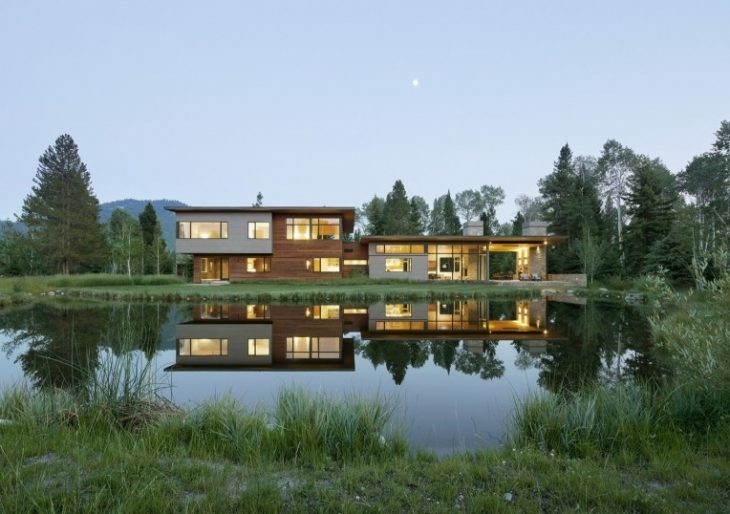 JD2 Residence, Wilson, Wyoming. Carney Logan Burke. “Carney Logan Burke was tasked to design an entire compound for a young family relocating from the San Francisco Bay Area to Wilson, Wyoming. From siting and entry sequence to conceiving a full complement of primary and secondary structures — a 5,300-square-foot residence, guest house and gear barn with a pond, waterfall and landscaping — principals John Carney and Matt Thackray and head of the interiors team Jenn Mei worked closely with the clients to bring all aspects of the project to fruition. The site was level, treed with aspens and conifers. It enjoyed mountain views and proximity to town, but presented challenges in siting to take advantage of views while minimizing road noise and glimpses of neighboring homes. The clients envisioned a contemporary house with generous glazing and fresh interiors overlooking a naturalistic pond. Working within the design guidelines of the residential association, the main structure’s zinc panels, cedar planking and stone are mimicked in the smaller guest house set amidst the aspens a short distance away. The primary residence takes shape in two volumes. The flat roofline of the mostly transparent single story — which encompasses the open plan kitchen/living/dining areas — extends over an outdoor living room anchored on either side by twin fireplace masses. The two-story residential volume houses bedrooms and utilities downstairs and the master suite upstairs to take advantage of enhanced views. The master suite’s sitting room with built-in daybed connects to the sitting room outside the childrens’ rooms via a floating bridge that passes above the home’s main entry. Both of the home’s masses have protruding volumes clad in zinc panels, which add interest and depth to the design. On the two-story volume, these are contrasted with horizontal cedar cladding.